Seattle Times Gives Four Stars! 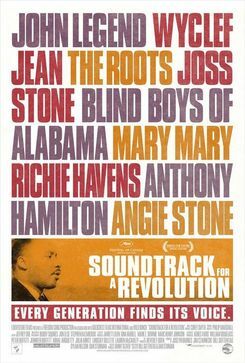 Movies | ‘Soundtrack for a Revolution’: a powerful mix of music, civil-rights history | Seattle Times Newspaper. “Soundrack” plays Northwest Film Forum April 30-May 5. Posted in Uncategorized | Comments Off on Seattle Times Gives Four Stars! Are you a Hotmail user who is wondering why you haven’t received any email announcements from Northwest Film Forum in a while? Well it turns out that there is an issue between our email provider, Speakeasy, and Microsoft that is barring communication. It’s nothing specific to the Film Forum, but rather all Speakeasy customers. Email service will hopefully resume shortly, but meanwhile, how about subscribing to our RSS Calendar feed to make sure you don’t miss anything? Our summer 2010 calendar is now available for your viewing pleasure online! Expect a few other exciting additions as well, as we finalize our late May-August lineup. This summer can be summed with “music, music, music” and “guests, guests, guests.” Just take a look at our Music Movies listings, and our Special Guests page. Whew! Harmony Korine to Peter Bratt… The Moody Blues to Mogwai… I’d say it’s time to start marking your calendars! Stay tuned for our summer workshop information. Good news for the Columbia City Cinema! Hooray we did it. Or rather you did it. The world’s longest rent party just keeps happening. We paid the rent and we’re half way to our goal of $20,000. That’s the magic number that will keep us going to live and movify another year. So thank you, thank you, thank you, everyone. We are humbled and deeply grateful for your generosity and your love for the cinema. Money has been pouring in just like that scene in It’s a Wonderful Life when the Building and Loan gets saved. So please keep it coming Thanks to those who have already donated and thanks to those who are about to donate (about 2000 of you). We’ve got your names. If you all give at least $10, we’ll be over the top. Haven’t donated yet? Too shy? Just click on the Donate online button at the bottom of the page. Not only does it help the cinema, clicking the button also gives you a colossal high. Posted in Uncategorized | Comments Off on Good news for the Columbia City Cinema! Now that “The Immaculate Conception of Little Dizzle” has been picked up for distribution by the new Tribeca Films, seeing the film has become much easier! Northwest Film Forum is pleased to announce that we will be presenting the Northwest theatrical premiere this summer, August 13-19. More information will be coming in our pending summer calendar, so check back soon. Finally, starting yesterday (April 21) the film will be available On Demand from Comcast, Time Warner, Cox, Cablevision, Brighthouse, Verizon FiOs, RCN and Bresan; on PPV from Directv Cinema; and online from Amazon On Demand and YouTube Rentals. For more information go to http://www.tribecafilm.com/tribecafilm/providers/. Below are some notes on Elia Kazan’s 1960 film WILD RIVER, which we open this Friday in a newly restored 35mm print. The working titles for this film were Mud on the Stars, Time and Tide, The Swift Season and As the River Rises. When initial grosses for the film fell below Twentieth Century-Fox’s expectations, the title was temporarily changed to The Woman and the Wild River to accompany an advertising campaign emphasizing the love affair between the characters portrayed by Montgomery Clift and Lee Remick. Both of the novels on which the film was based, William Bradford Huie’s Mud on the Stars and Borden Deal’s Dunbar’s Cove, examined the impact of progress on the rural South in the decades preceding World War II. Wild River was the first film based on a work by Huie, whose novels had earlier been deemed too controversial for the screen. In a New York Times interview dated February 1960, Huie noted that six films based on his work were currently in production, including Wild River, a situation made possible by “the recent liberalization of the industry’s self-censorship code.” The 1962 film The Outsider and the 1964 film The Americanization of Emily were also based on Huie’s works. The film’s prologue consists of black-and-white footage of a raging flood and the devastation left in its wake, followed by a newsreel-style interview with a survivor. An offscreen narrator provides the film’s historical background, stating that on May 18, 1933, Congress created the Tennessee Valley Authority (TVA), a massive public works program designed to end the loss of life and property caused by the overflowing of the Tennessee River. According to a modern source, the black-and-white opening footage is taken from Pare Lorenz’s 1930 documentary, The River. Although reviews for Wild River list Robert Earl Jones’s character as “Ben,” his character’s name in the film is “Sam Johnson.” Wild River marked Bruce Dern’s motion picture debut. Daily Variety news items dated August 1957 and September and October 1958 reported that first Ben Maddow and then Calder Willingham had been signed to adapt Mud on the Stars for Elia Kazan. However, these writers are not credited onscreen and the extent of their participation in the finished film has not been determined. A modern source reports that Kazan had hoped to write the script himself, but after a number of unsuccessful drafts, worked closely with Maddow and Willingham before hiring Paul Osborn. Nine drafts of the script were written and additional working titles reportedly included God’s Valley, The Coming of Spring and New Face in the Valley. According to Daily Variety and Hollywood Reporter news items dated March 1959, Marilyn Monroe was scheduled to play the female lead. In his memoirs, Kazan recounted that Twentieth Century-Fox executives urged him to hire Monroe, an idea he called “absurd.” Kazan added that he never considered anyone for the role but Lee Remick, whom he had directed in his 1956 film A Face in the Crowd. Wild River was shot entirely on location in Tennessee, in the towns of Cleveland, where the cast and crew were lodged, and Charleston, and on Lake Chickamauga and the Hiwassee River. The large set used for the Garth farmhouse took two months to construct at a cost of $40,000 and was subsequently burnt down for one of the film’s final scenes. Eighty percent of the film’s approximately fifty speaking parts were filled by locals with no previous acting experience. According to an article published in LA Mirror-News in November 1959, Kazan sparked a controversy in Cleveland after he hired extras from a slum known as “Gum Hollow” to play Depression-era Southerners. A number of prominent townspeople were angered by Kazan’s casting choice and allegedly claimed that the “white trash” of Gum Hollow did not accurately depict the area’s Depression unemployed. Kazan reportedly had to reshoot a few scenes, this time using “respectable, legitimate unemployed” in place of the “squatters.” According to information in the production file on the film in the AMPAS Library, during filming, Remick’s husband, television producer William Colleran, was in a serious auto accident and Remick returned to Los Angeles, causing production to shut down for one week. That delay, coupled with bad weather, put the shoot one month behind schedule. According to a modern source, Kazan’s earliest inspiration for Wild River came after a visit to Tennessee in the mid-thirties and a stint working for the Department of Agriculture in 1941. In his autobiography, Kazan stated that he had planned for many years to make a film which would be “an homage to the New Deal,” but that by the time he began working on the script, he had developed sympathy for the anti-progress stance represented by the character of Ella Garth, making Wild River his most ambivalent film in terms of its treatment of political and moral issues. A modern source reports that Kazan wanted Marlon Brando for the male lead, but he was unavailable. Kazan, who had directed Clift in a 1942 production of the play The Skin of Our Teeth, was at first adamently opposed to hiring Clift because of the actor’s drinking problem. Clift reportedly promised Kazan that he would stay sober for the duration of the shoot and he was accompanied to Tennessee by a secretary assigned to keep an eye on him. With the exception of one brief binge near the end of production, reported Kazan, Clift kept his promise. A modern source adds Hardwick Stuart (Marshal Hogue) to the cast. The Cannes Film Festival runs May 12-23. Congrats go out to Longhouse Media Executive Director Tracy Rector. Her short film UNRESERVED: THE WORK OF LOUIE GONG is on its way to Cannes! Seattle is a haven for live music, and Northwest Film Forum is the home for many concert films that pass through our city. This quarter alone we screened films featuring Leonard Cohen’s performance at the Isle of Wight, the White Stripes tour through Canada, and a Bill Withers doc that includes plenty of concert footage. To honor our musical heritage, this quarter we ask local filmmakers to turn their eyes on the music scene and make concert films no longer than 5 minutes for the Concert Film Challenge. Since we expect the response for the challenge to surpass previous challenges, we reserve the right to curate this program, and possibly host multiple screening dates and times. The project is open to all levels of skills and experience. Send submissions to: Northwest Film Forum, c/o Adam Sekuler, 1515 12th Ave, Seattle, WA 98122. For more information email Adam Sekuler at adams@nwfilmforum.org. Formats: 35mm, 16mm, super-8, digiBETA, BETA SP, DVCAM, and DVD. Please Include title, filmmaker’s name and contact info with submission. Support independent cinema! Join a community of film lovers! Become a member today. Local Sightings is our annual showcase of current narrative, documentary and experimental film by Northwest artists. The week long festival also features panel discussions, historic NW films, a filmmaker lounge, a stellar opening night party, and juried awards for a winning short and feature film! Submit your work by downloading the submission form from our website: (www.localsightings.org) and send us your screener copy on DVD. The deadline for submission is July 1. Buy yourself a houseplant, there’s no entry fee! It was a very busy weekend here at the Film Forum, with the popular Visual Music playing against the Herzog/Lynch curiosity My Son My Son What Have Ye Done. Though we were excited by the great turnout, we weren’t pleased to have to turn away so many filmgoers! With that in mind, we are happy to announce we are extending the run of My Son through April 22. The film will now play daily at 7 and 9pm through April 22. Please note, the one exception is Saturday, April 17 when the movie will ONLY show at 5pm.